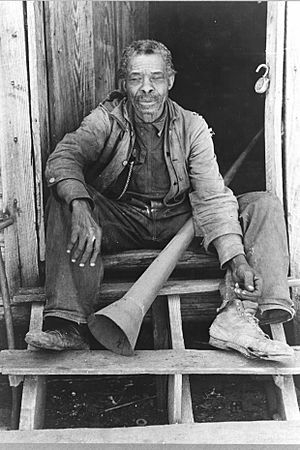 Old former slave with horn formerly used to call slaves, Texas, 1939. Photo by Russell Lee. A freedman is a former slave who has been released from slavery, usually by legal means. Historically, slaves became freedmen either by manumission (granted freedom by their owner) or emancipation (granted freedom as part of a larger group). Compared to other ancient peoples of the Mediterranean basin, the Romans were relatively liberal in freeing slaves and granting them Roman citizenship. In fact, freedmen formed about 5% of the population of Rome during its Imperial Age. Slaves were able to earn their freedom in more than one way. Educated and trained slaves were almost always freed, a practice that was so common that Emperor Augustus passed a law prohibiting the freeing of slaves before they reached the age of thirty. A slave could also be freed as a reward for long and dedicated service, and many were freed in the wills (and therefore at the death) of their owners. Freedmen were able to own their own land. However, they were not full Roman citizens. They could not run for public office, nor hold a high rank in the army, although their children were afforded full citizenship. In the United States, the term "freedmen" refers chiefly to former slaves emancipated during the American Civil War. Slaves freed before the war, usually by individual manumissions, often in wills, were generally referred to as "Free Negroes". Although the Emancipation Proclamation declared all slaves in states not under the control of the United States of America to be free (eg: the Confederacy), it did not end slavery in the Union states. The end of all slavery was accomplished as a result of the Thirteenth Amendment to the United States Constitution. The Fourteenth Amendment gave ex-slaves full citizenship. The Fifteenth Amendment gave voting rights to adult males among the free people. The 13th, 14th, and 15th amendments are known as the "civil rights amendments", the "post-Civil War amendements", and the "Reconstruction Amendments". To help freedmen transition from slavery to freedom, including a free labor market, President Abraham Lincoln created the Freedmen's Bureau, which assigned agents throughout the South. The Bureau created schools to educate freedmen, both adults and children; helped freedmen negotiate labor contracts, and tried to minimize violence against freedmen. The era of Reconstruction was an attempt to establish new governments in the former Confederacy and to bring freedmen into society as voting citizens. Freedman Facts for Kids. Kiddle Encyclopedia.